Welcome To The ECG Virtual Studio Tour! Our recently-expanded 8500 square foot video production and post production facility includes a conference room, 6 full-service edit bays, 1 full-service audio suite, and 2 full-service graphics and animation suites. Our studio space is fully pre-lit with DMX controlled, fully-dimmable dual color temperature LED lighting and includes a corner cyc green screen, full rigging grid, and a fully-stocked gear warehouse. Take a look around with our virtual tour – we think you’ll like what you see. 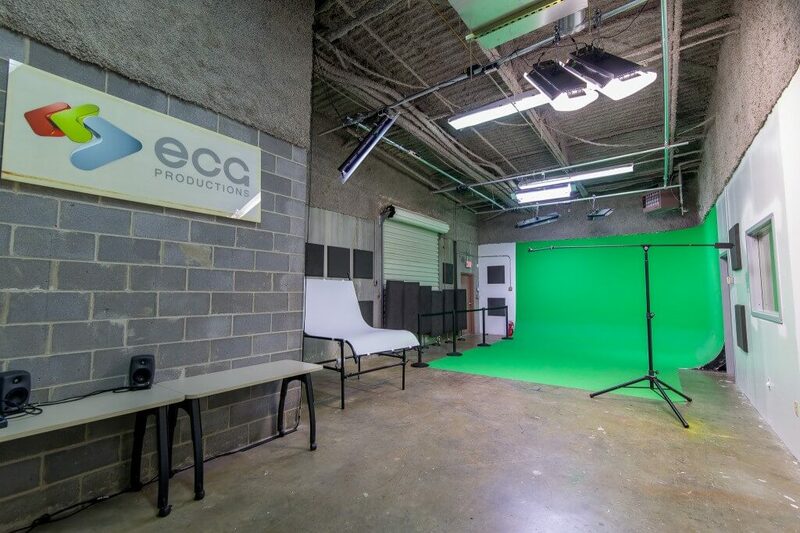 ECG Productions boasts an in-house studio with full audio and video equipment capabilities. Our studio features a green screen cyc wall, TV white wall, and a full rigging grid, complete with 6 pre-hung DMX controlled dual-color temperature LED lights. We have a full arsenal of equipment at our disposal featuring all departments. The studio also features a K13 sound-proofing, product table and full bay door for loading and unloading props and sets. Listen up! 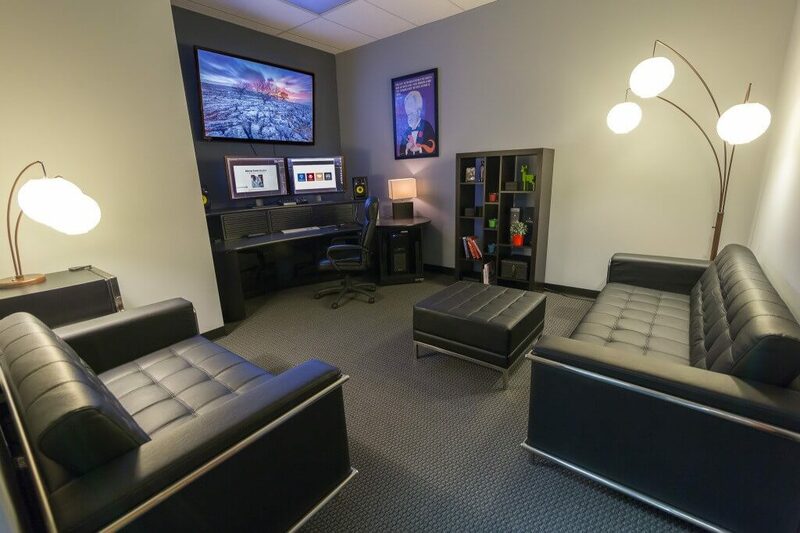 ECG offers a robust, fully-equipped audio suite, complete with Adobe Creative Suite, 4K resolution TV, and our brand-new WhisperRoom. 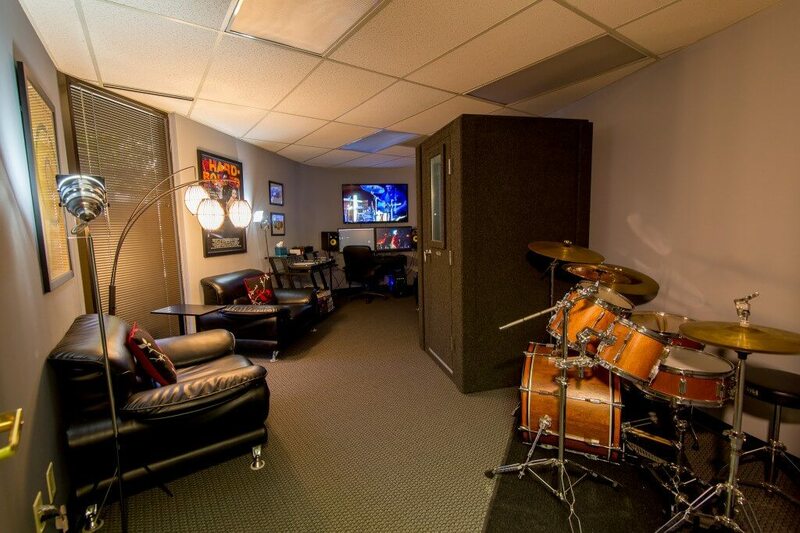 A WhisperRoom offers premium sound isolation, perfect for recording voice overs and music. Not only does ECG record, we also offer sound mixing, sound editing and sound design. We also offer a turntable with records and drum set, in case you feel like mixing it up in the studio. At ECG Productions, we place a high value on our relationship with clients. We don’t want to work for you; we want to work with you to create the highest quality of work to support your vision. Whether you need a corporate video, have a story for a documentary, or have an idea you haven’t fully realized yet, we’d love to have you in for a chat! 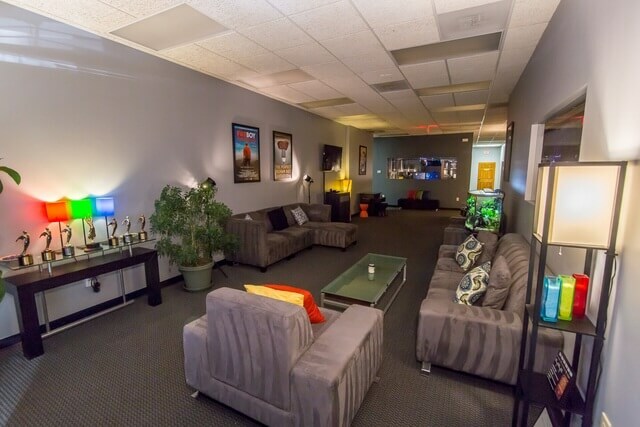 Take a look around the ECG Productions offices and editing suites! 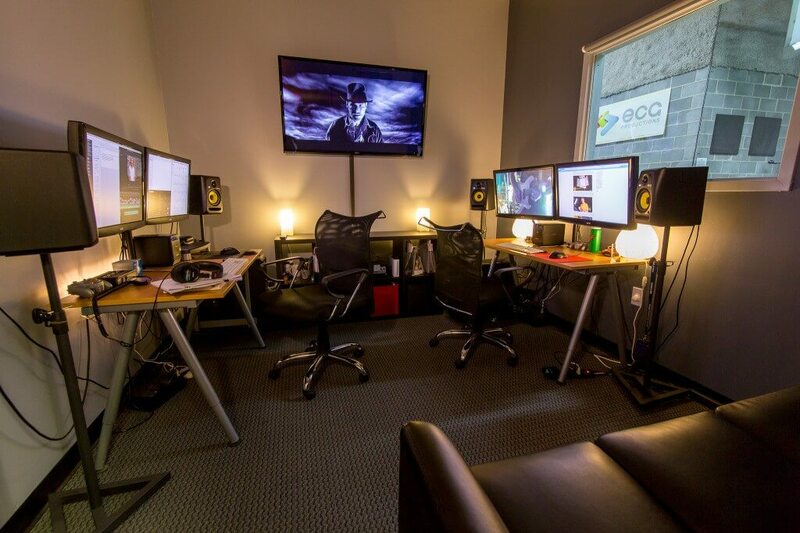 All of ECG's editing suites are equipped with the full Adobe Creative Suite and were designed in accordance with “The Anatomy of an Edit Suite,” by Biscardi Creative. Each suite is optimized for comfort and efficiency for both the client and editor. Not only that, the decor promotes a creative work environment for all who enter. 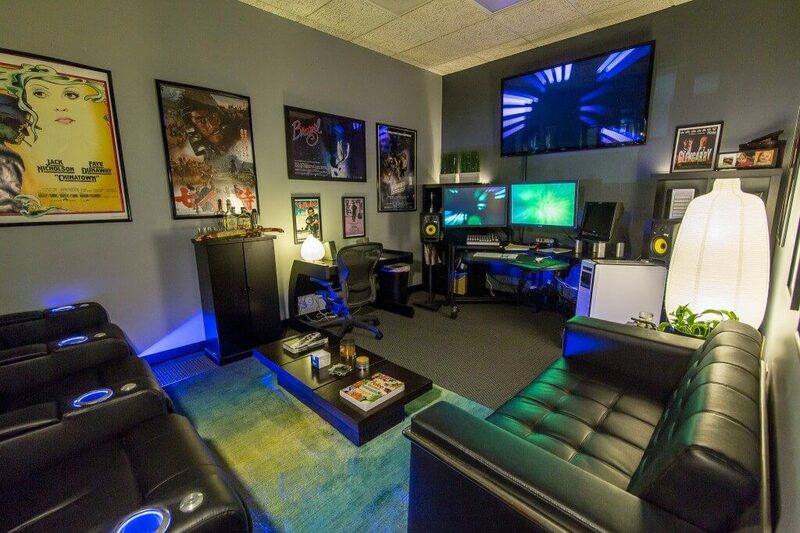 This is co-owner and director Jason Sirotin's office and editing suite. In addition to the full Adobe Creative Suite, Jay's office features a triple-monitor setup with 4K TV for presentation purposes. Combine Jay's multi-screen setup with his theater-style leather chairs and you've got the makings of an office theater. What's more, he's also got a keyboard controller for scoring purposes! ECG co-owner Trey Gregory's suite also features a four monitor setup. Trey's suite is often utilized for animation and visual effects, as it is optimized for color-grading with a Flander's Scientific Monitor. It is a cozy retreat where editors and clients can meet to focus on the intricacies of design. This is ECG's director of photography Brandon Peterson's office. 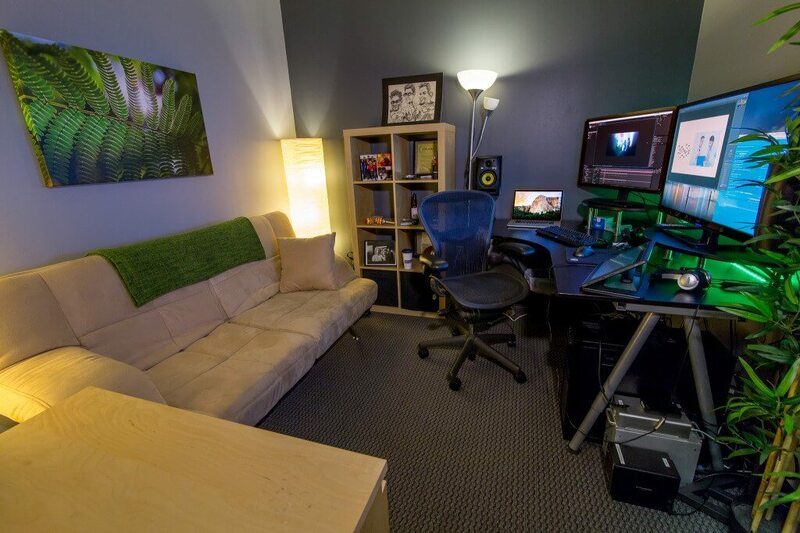 Like the others, Brandon's suite is fully equipped with Adobe Creative suite and a 4K monitor. Brandon's office also features a Wacom Cintiq companion hybrid tablet and stylus. It allows designers to draw directly on the screen in Adobe Photoshop and can be used for drawing, painting, designing, story boarding and masking. 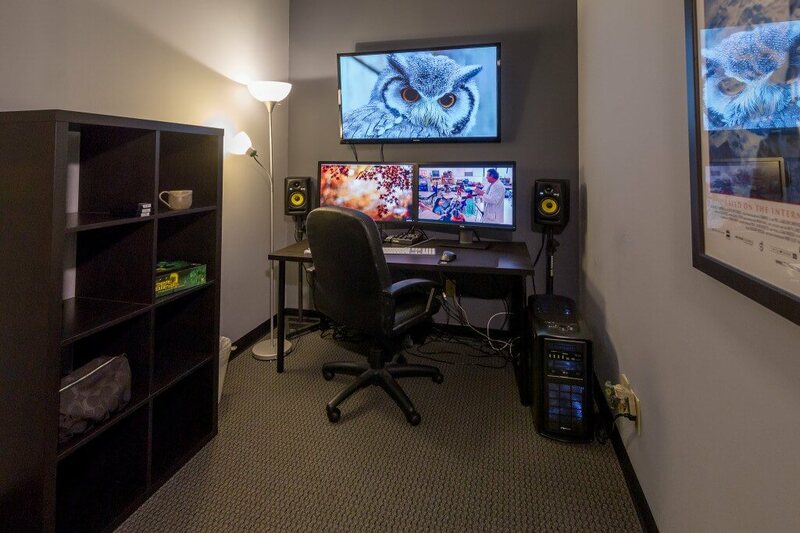 Collin Ingrim's office includes 2 full editing suites with studio pass-through, which enables recording direct to hard drive during studio shoots. It also houses a 4K resolution broadcast television for presentation purposes (and a Wii for relaxation purposes!). This is Kelsey Merriam's editing suite and home to over 50 paper cranes. When she's not editing, Kelsey works as a production assistant on shoots. David Hixon is one of ECG Productions' incredible animation and graphics artists. He has done work for some big-name clients such as Aflac, Precision Toxicology and PGi. He has done effects for ECG music videos and specializes in 3D animation. Here at ECG, we know that video production is just one piece of the puzzle. Thanks to our partnership with Atlanta marketing agency, Brain Bytes Creative, ECG Productions takes you one step further by designing and delivering multi-platform marketing campaigns. Need a website? Want to build an app? We’ve got you covered! Check out our in-house marketing space. ECG Productions is not only a great company to work with, but a great company to work for. We place high value on a strong work ethic and getting the job done right for the client, but we also know the importance of having fun along the way. Sometimes you can catch us checking out the latest movie trailers, sharing viral videos, having company-catered lunches or even playing a few video games. Thanks for stopping by! We hope you like what you saw, and that we'll be seeing you at the ECG Productions offices soon.